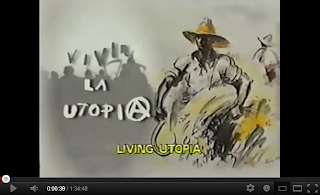 Living Utopia is a unique documentary that blends the historical account of the origins and development of the Spanish anarchist movement, focussing on the 1936 war. A reflection on the philosophical underpinnings of such a movement and their practical application. As both an informative and inspiring piece of research it is considered a jewel amongst historians and rebel hearts. This documentary-film by Juan Gamero consists of 30 interviews with survivors of the 1936-1939 Spanish Revolution, and is one of the best documentaries dealing with the theme. The testimony of the anarchist militants are very moving indeed, and are showing the constructive work of the social revolution in Spain. This "Anarchy in Action" meant: on the land around 7 million peasants form collectives, in the city 3000 workplaces collectivised, 150 000 join the anarchist militias to fight fascism, as well as cultural activities and the movement of the Mujeres Libres to free the women from patriarchy.